Located in the middle of the Saharan Desert, Erg Lihoudi Camp offers authentic Berber accommodations and includes evening open-air folk shows around the campfire. Zagora is just over an hour’s drive from the camp. Decorated in a traditional Berber style with carpeted floors, all tents include shared bathroom and toilet facilities. A characteristic Saharan breakfast is provided each morning at Erg Lihoudi Camp. Local cuisine is available in the communal dining area, upon request. 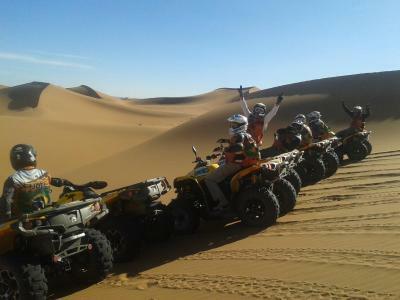 Additional features include camel riding, quad biking and 4x4 trips as well as the organization of tour excursions and airport transfers. 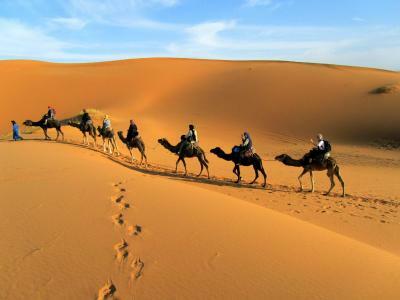 Ouarzazate Airport is over a 3-hour drive away and Kelaa Mgouna Oasis is a 4-hour drive from the camp. 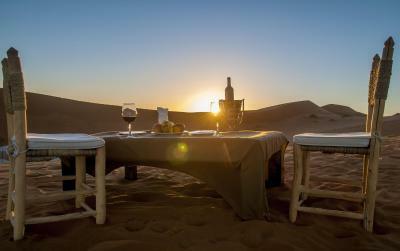 When would you like to stay at Erg Chegaga Camp? Decorated in a traditional Berber style with carpeted floors, this tent includes shared bathroom and toilet facilities. House Rules Erg Chegaga Camp takes special requests – add in the next step! Erg Chegaga Camp accepts these cards and reserves the right to temporarily hold an amount prior to arrival. We need at least 5 reviews before we can calculate a review score. If you book and review your stay, you can help Erg Chegaga Camp meet this goal.